I’m so glad Jon Rappoport’s writing extensively about the TPP. This is a must read article connecting dots for anyone who’s wondered why I keep referencing this as one of THE most important things needing to be flushed out and away. 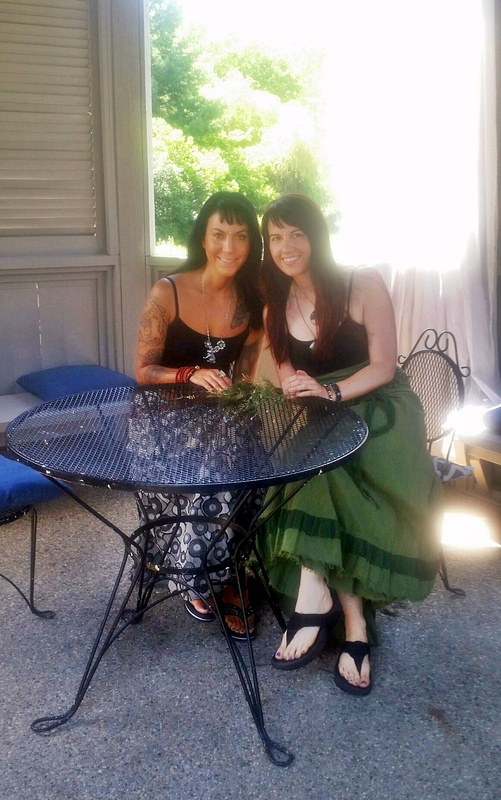 It was a long time coming for Laura and I to reconnect in the Faery flesh – what seemed like nearly 6 years – but last week saw the end to that physical separation drought, as we came together in Goshen, IN. We share that rare kind of friendship that has no “needyness” and yet we are also so close that we never feel the distance despite hardly ever having spent much in-person time together over the years. We are in constant connection telepathically, via text and email, and the very very random phone time, however, our connection just increases. For us both, we cherish the kind of friendships that honor our independent natures and yet support the unique oddities we each have and desire from our relationships. 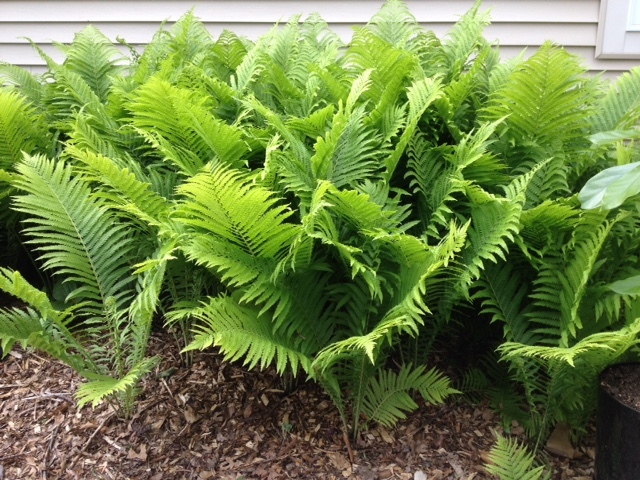 Ferns and Jack in the pulpit are probably six inches higher than when I snapped this photo two days ago. 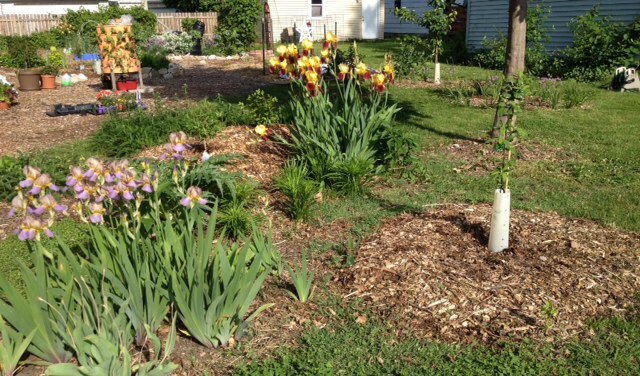 The other side of the driveway, with irises, blueberry bushes, cardoon, liatris, echinacea, my prized medlar tree and the back/side yard gardens in the distance, including Garden Tower. 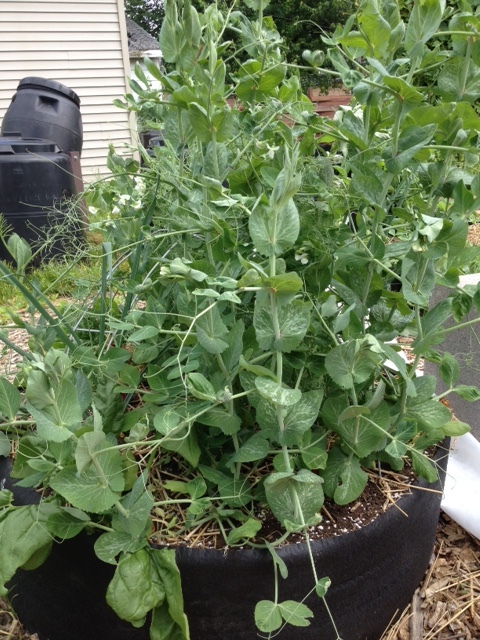 The mixed edible cover crops are growing fast. 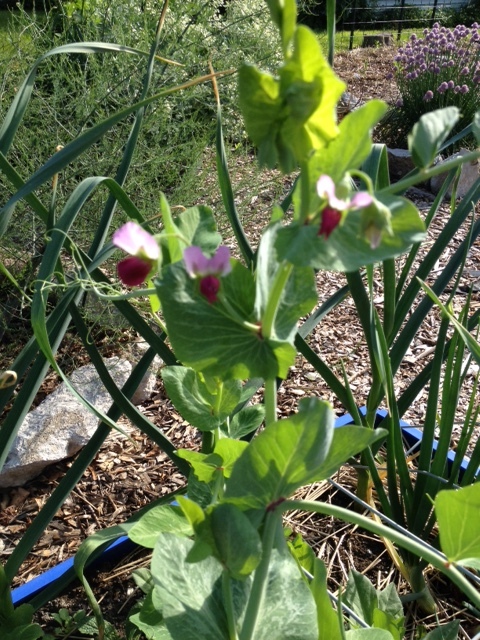 I knew the fava beans would look pretty, but I wasn’t expecting pink blossoms from the rest of the mix! 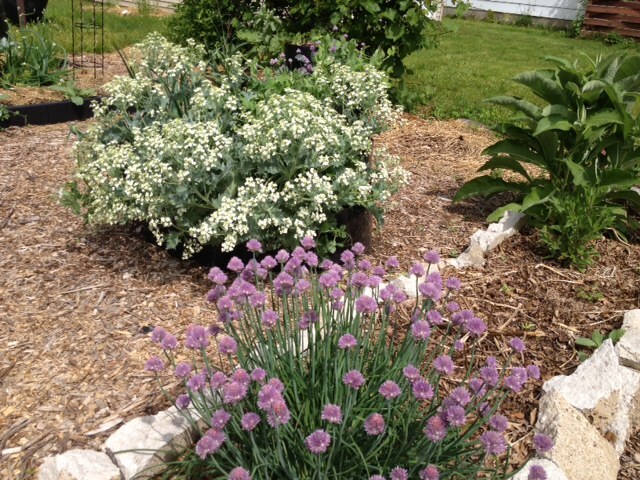 Chives, sea kale, elecampane, grape vine and the beginnings of good bug mix flowers. 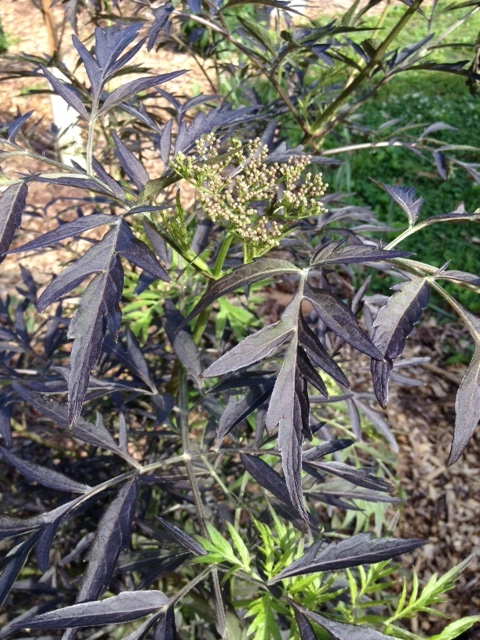 Black lace elderberry starting to bloom next to quince, strawberries, hazel and comfrey. 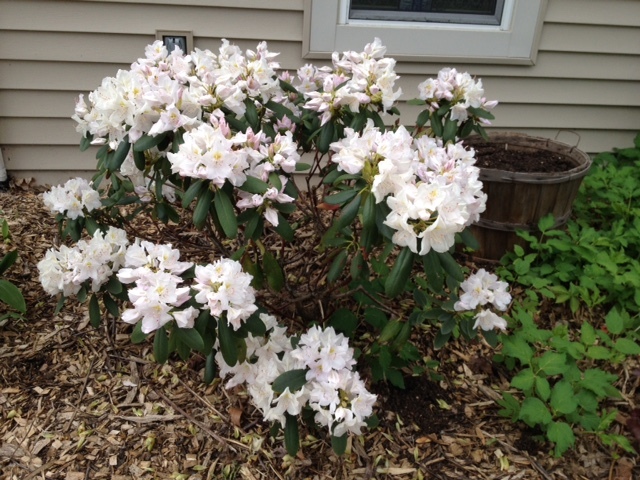 Rhododendrons always bloomed on my birthday as a child. This year they arrived one week early but still going strong. 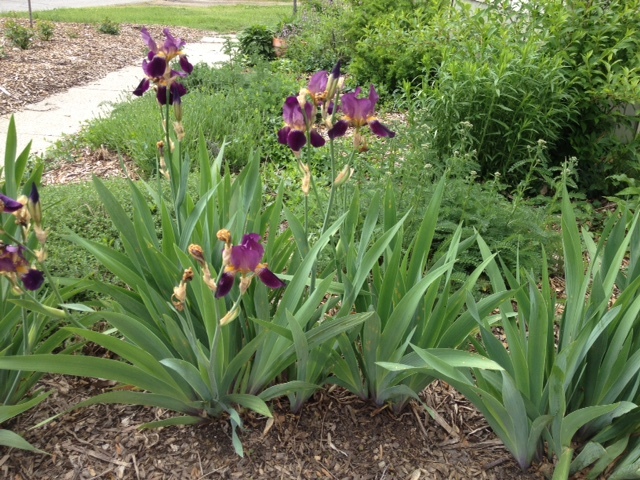 Iris in the front of the driveway, next to yarrow, just sprouting hyssop, aster, echinacea (coneflower), lavender, thyme, forsythia and more. 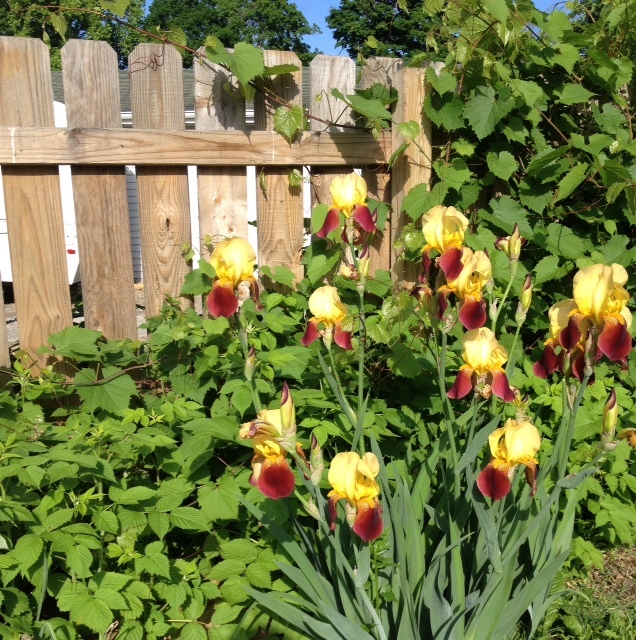 More iris along the back fence, with grape, raspberries and more echinacea. Most of these starts went in the ground during Tania’s visit last week, but I replanted some pots with seeds for even more abundance. 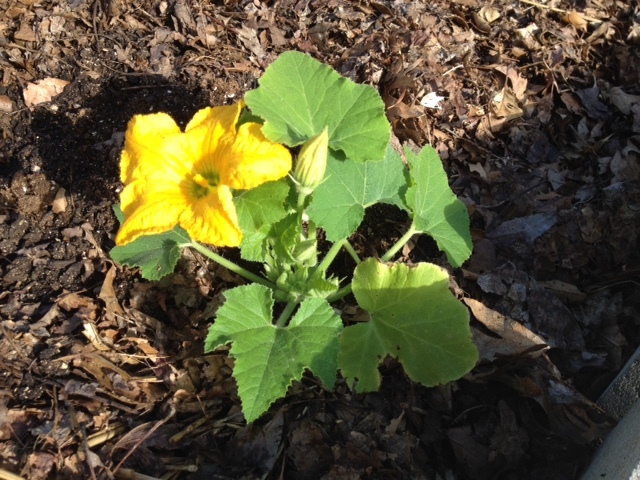 First squash blossoms are already out. In addition to companion planting borage, calendula and cilantro, I’ve protected the base of the stems with aluminum foil to foil the squash vine borers. If you saw my post, “How to Be Ultra Spiritual with JP Sears“, which includes in it another article I also shared titled, “Do You Wear a Spiritual Disguise? ~ Losing the Mask and Finding Your Truth” then you’ll understand this one too and have yourself a good belly laugh, and/or maybe even some interesting reflection. I’d like to also include JP Sears’ comment with the video, as it may ruffle some feathers and cause some triggers in some people. Thanks to Natural News and Reclaim Our Republic for this piece (and hat tip to hocuspocus13 for reblogging it). Anyone who thinks Hillary Clinton represents any kind of positive change for this country, please do read this piece in full, along with watching the videos if you still can’t see the writing on the wall. In addition to her wily, unethical (laughing about faking a polygraph test) defense of a man who raped a 12 year old girl, this “women’s advocate” is no advocate of anyone who cares about their food, their body or their rights to protect themselves from chemicals and the worst corporate thuggery. I’ve long been aware of this but haven’t had the time or stomach to put it all together. Thank you for gathering the details into one undeniable post. Just a reminder that you have a few days left to sign up for May Specials. I have no scheduling spots left for May, but if you sign up through May 31st, I’ll honor the discounted rates through May 31st, 2016. This is a good time to stock up on sessions if you’d like some in reserve. The June Reiki Level 1 Certification Class in Goshen, IN still has a couple spots remaining, and the Faery Workshop has one spot left. Those of you in PA, NJ, or NY still have a little while to sign up for the July 18 Reiki Level 1 Certification Class in Allentown, PA. The July class will be catered by an East Coast blog reader who generously offered to provide fresh, love-filled food for all attendees. 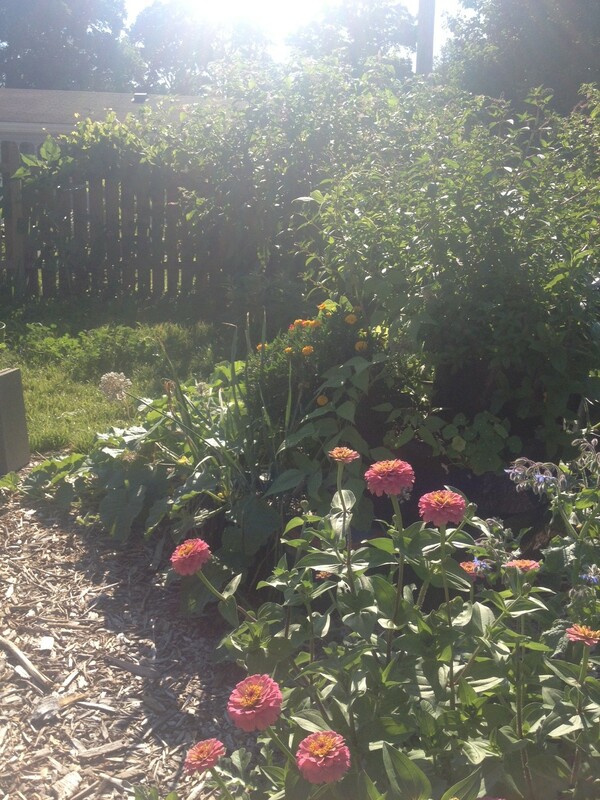 The Faery class will also include some garden fresh goodies from our yard and gardens. Please contact me if you’d like to sign up for this special. Offer valid if prepaid on or before May 31, 2015. This is a return of a popular 2014 special, which I feel called to highlight again now due to the variety of emails and comments I’ve received from clients and friends that “things just got too close to home.” Possibilities that seemed remote are suddenly showing up in their towns or among their social set, and people want to know how to maintain an optimistic vibration while also shoring up any weak spots. This special responds to many comments, questions and private emails requesting my take on the question “What can I do right now?” — for specific individuals, rather than general guidelines and suggestions. Certification: At the end of the training, each student will receive a certificate acknowledging completion of Reiki Level 1, as well as recognition as a Reiki Level 1 Practitioner. Taking any Reiki training with Laura Bruno also qualifies each student to audit (at no cost) any additional Reiki classes taught by her, up to and including the level completed with her (space permitting). Fee: Regular rate for Reiki 1 Certification is $175. If prepaid in full two weeks in advance, cost is $150. Pre-registration and a $25 non-refundable deposit are required to reserve your spot. For more information or to register, please contact Laura Bruno. In honor of Summer Solstice and the transition from one season into the next (the Fae like thresholds), we will finish this class with a short faery ritual to welcome Summer, followed by “tea and cakes” (gluten-free, sugar-free vegan options available). Please note that I have scheduled this class after the Reiki 1 Certification Class in Goshen, in case out-of-town students prefer to make just one trip to Goshen. Lodging recommendations available upon request. Fee: $125, which includes a $25 non-refundable deposit to reserve your spot. Space is limited, and I’ll need to know numbers several days ahead of time in order to harvest/prepare food and materials.